3.9 out of 5 based on 54 bloggers and 11 commenters. 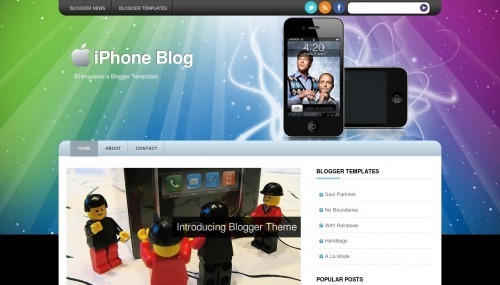 iPhone Blog is a free blogger template adapted from WordPress with 2 columns, right sidebar, fresh look, rounded corners, footer columns, slider, social bookmarking icons, posts thumbnails and abstract. Excellent template for blogs about fantasy or software. I absolutely loved this template! My favorite part is the slider. Very fun! Thank! How do I remove the slider?